Strange Machines return to The Acoustic Friday, April 26th with special guests No Mind! Boston-born, New England based quartet Strange Machines have been steadily making a name for themselves in the East Coast jam scene. A true melting pot of musical fusion, with sounds catering to funk, livetronica, rock, reggae and a multitude of other genre’s, all while stringing them together seamlessly to create a fluid and captivating live performance. Their original songs are nuanced by creative composition, practiced precision, and a looseness that allows them to truly explore the music they create. Black Rock’s finest are at it again to FUNK YOU UP! Featuring members of Deep Banana Blackout, Kung Fu and Elle King! 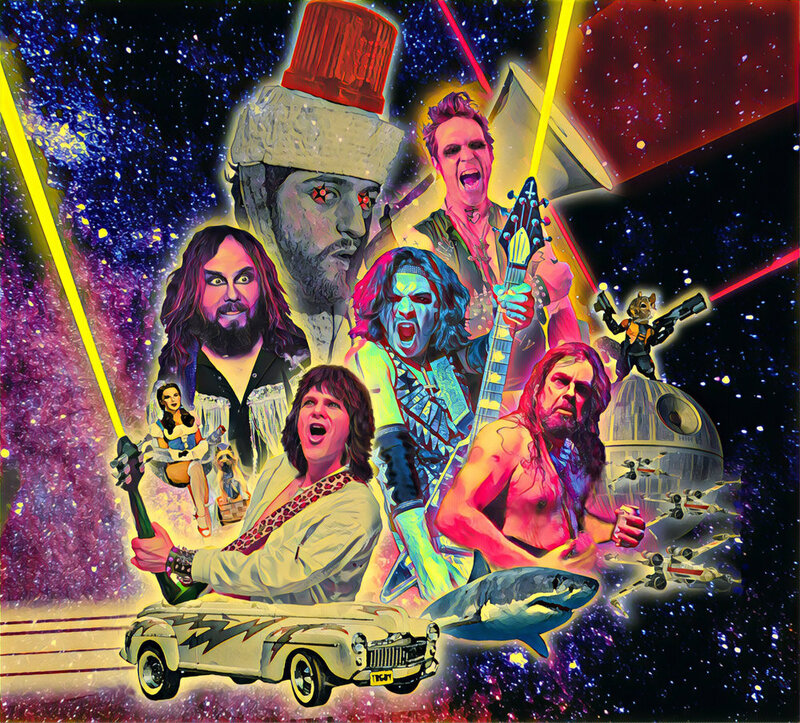 After eleven years and five albums of pure, glitter soaked disco-metal, NYC’s TRAGEDY: ALL METAL TRIBUTE TO THE BEE GEES & BEYOND has turned their attention to the silver screen. Tragedy Goes To The Movies features metal-injected takes on music from cinema classics such as Grease, 007 Skyfall, Hair, and Star Wars: Return of The Jedi. Album to be released mid-February and World Tour begins February 22. The tour will go to UK, Belgium, France, Netherlands, Germany and USA. The Cosmic Jibaros Music builds from Latin and Caribbean rhythms, Rock guitars and World music influences for a sound that’s both cross-cultural and highly danceable. There’s an irresistible pull of traditional Afro-Caribbean Beats, interplays between the congas and timbales mixed with urban elements in the deep drum and bass and effects-laden guitar work. These songs are laced with social and political overtones, and are sung primarily in Spanish by charismatic front man Rick Reyes. Los Vegas is a brand new project featuring William Vega of Big Moon, Juan Carlos Vega of the Cosmic Jibaros, and honorary Vega’s Lawrence Rodrigues James Cote and TBone Stone. Blending Latin, Blues and Rock music for this Cinco de Mayo Celebration. Pink Floyd funked up for your delight, featuring members of The Breakfast, No Mind, Defcon 3 & more! People's Blues of Richmond (or PBR as they are affectionately referred to by their fans) is one of those rare three-pieces that somehow conjures the sonic power and visual intensity of a thunderstorm. Think Jimi Hendrix Experience meets MC5. They take psychedelic blues rock to a different level with a lyrical element seldom found in the genre. Think Bob Dylan writing lyrics for Black Sabbath songs. It’s hard to imagine until it’s right in your face. Then it’s hard to forget. From their home in Syracuse NY, Sophistafunk has gained international notoriety with their unique combination of live hip hop, funk, and jam music. Tracy Jo & The Toads is a blend of roots rock, blues and gritty soul. After living and studying music in New Orleans, Tracy Jo retreated to Connecticut to form a new group featuring the singer in 2015. A talent not to be missed, Tracy has performed alongside many musicians among the live circuit, including members of The Grateful Dead, the Disco Biscuits, and Lettuce; and at several festivals including Gathering of The Vibes and Rock n Roll Resort. Stephane Wrembel is presenting his new album The Django Experiment IV. The Django Experiment is a special series of recordings. The concept is a tribute to the great guitar master, Django Reinhardt; mixing compositions and influences from other landscapes of the musical world, aiming to create an inner journey for the listener. If you've never been to a Mojo show, eliminate yo' FOMO, May 25th at The Acoustic! Congratulations Mutha Funka's!! Its another year of the most ballinest funk to ever showa your earholes. This coming Memorial Day weekend, hang up your hang up your hang ups, get out yo seat, on yo feet, and dance in the fire with MOJO, Black Rock's premier funkatiers. We will make your booty wet with tha sweat and slick with tha stink. We will funk wit da skunk and move tha junk in yo trunk. We'll throw bank on tha stank when our booties get spank't. Loosen yo caboose with the Platypus and join us in a Funky Sing-A-Long. The show starts with The Drew Angus Band, and bumps into the morning with DJ Doey Joey. The Mushroom Cloud is an explosive funk-rock band from New Haven, CT with Paul Harris on guitar, keys, and vocals, Matt Cuddy on guitar, Max Schiavone on bass, and Russ Harris on drums. Since they formed in 2011, The Cloud's been blending funk, rock, jazz, and electronica into cleverly written passages of music mixed with powerful improv jams. Their organic and original sound is constantly evolving, taking listeners on vibrant journeys in their heads and on the dance floor, and their unique energy resonates deep in the soul. With their second full length albu, "Air Raid," out now everywhere, and a new album in the works, things are heating up for this bright young band! For tour dates and more go to www.themushroomcloudmusic.com. Richard Neal and his pickin pals are hosting another night of Bluegrass and Beer. Come listen to one of America's great inventions. With talent and Dead-ication, Stella confidently delivers tunes from all stages of the Grateful Dead's 30-year run: from hits like Truckin’, Touch of Grey and Shakedown, to the groovin’ late 60s jams of St. Stephen, Lovelight and Hard to Handle, to the most complex tunes from deep in the repertoire like Unbroken Chain, Help on the Way/Slipknot and Here Comes Sunshine. Most of all, Stella captures the unique sound and adventurous spirit of the music and that special feeling and community unique to Grateful Dead shows. Our attention to the details of sound and love of the music are apparent from the first note of an SBB show to the last. 'member? is back at The Acoustic for a night of paying homage to the legendary Bill Withers. We will have DJ Doey Joey warming up the night followed by two sets of Bill Withers mixed in with some other choice favorite songs. Don't miss out on this one! Come and dance the night away with the smooth sounds of Big Yachty in support of Little Black Dog Rescue. No Mind's sound is an eclectic mashup of Funk Infused Rock, Reggae, Dub, and Jazz Winners of Locals Live 2017, No Mind has shared stages with Many of New England’s best acts including West End Blend, Bella’s Bartok, Hayley Jane & The Primates, Strange Machines, Will Evans, The Mushroom Cloud, Shakedown, JOON, and Many More. Philadelphia's funktronica powerhouse, Tweed, is filling dance floors with their high-energy fusion of funk, disco, progressive rock, and electronica. Just as their namesake fabric of mingling colors and textures, Tweed has interwoven a psychedelic web of high energy performance and improvisation. Their collaboration can take listeners from multi-layered visions through the psyche to sweaty, raging, disco dance parties driven by their own incessant beat. With national tours, countless festival appearances, and a uniquely cohesive sound, they have proven they can bring the fun anywhere they go. “The Spadtastics” is a terrible name for a Grateful Dead cover band. So they make up for it by playing their collective asses off—creating lysergic-laced interstellar jams that will make you question reality and quit your day job. They reach into your solar plexus, tear out your heart, and beat it with mallets made of cocobolo, milled steel, and peonies, and shove it back in at the end of the set. You don’t just leave a Spadtastics show having been entertained; you are made a better, more compassionate human being. Shock Wave will be the featured artist this month at The Acoustics Open Mic Night, and it's going to be an awesome night with Half Full Brewery on site as well! Sign-ups start at 7:30, and all forms of performance art are welcome. The Acoustic has a full backline provided, so all you need is your guitar, bass, harmonica, voice, whatever your performance of choice might be. Half Full will be in attendance pouring samples of their beer as well as giveaways. To make it even better, every performer will receive a free pint glass!! How can you go wrong? A night of good music, good drinks, and fun people. You know you want to be there! Elle's convergence of grit and grace separates her from so many singer-songwriters of today. She is pure emotion and intention. All pouring out of a barely 5’ frame. From her roots in CT to gaining a foothold in NYC, Elle Sera is known for her soul-jolting songs, striking lyrics, edgy melodies, and resounding rhythms. On a lifelong mission to create a sense of unshakable solidarity with people worldwide by harnessing the infinite power of musical storytelling she is ever-branching out to reach new audiences and share her passion of music and the power of her voice. Having toured locally in the U.S and internationally in Europe she’s making her way charming audiences with her raw honest performances and a voice that makes listeners take note and lean in closer. 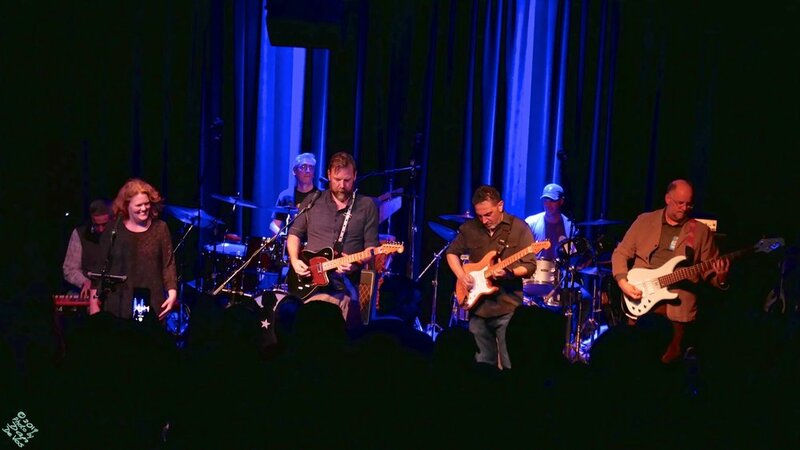 The Mallett Brothers Band is an independent rock and roll / Americana / country band from Maine. Their busy tour schedule since forming in 2009 has helped them to build a dedicated fanbase across the U.S. and beyond while still calling the state of Maine their home. With a style that ranges from alt-country to Americana, country, jam and roots rock, theirs is a musical melting pot that's influenced equally by the singer/songwriter tradition as by harder rock, classic country and psychedelic sounds. Come support local music and local radio at the same time. WPKN is a local radio station at Bridgeport University. Black Rock’s Funk Night is moving to The Acoustic. And we are happy to have them! The same funky grooves you know and love plus new expanding musical horizons. Now serving FOOD. Into The Mystic Returns to The Acoustic for A St. Patrick's Day Celebration! We are back at The Acoustic for another great night of Petty! C'mon out and sing along. Join 'member? as we make a return to The Acoustic in Black Rock to bring you a special tribute to Gorilaz and Daft Punk.